The Master Validation Plan provides a roadmap to management for on-time start-up of facility operations, and validation of existing facilities, in compliance with GMP requirements. The lack of a comprehensive Master Validation Plan and well-documented validation procedures is the main reason that new drug, medical device, medical equipment, and related product applications are rejected by the FDA. This thorough guide provides the needed solutions and guidance for both foreign and U.S. companies to achieve FDA compliance and authorization to market their products in the United States. 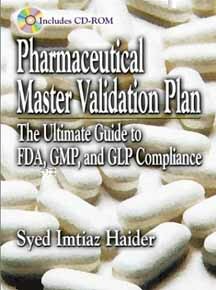 Pharmaceutical Master Validation Plan: The Ultimate Guide to FDA, GMP, and GLP Compliance will allow you to more easily achieve satisfactory inspections, new medical product approval, minimize non-conformance, reduce rework and rejected lots, and avoid recall lots by developing and managing a Master Validation Plan. The accompanying CD allows users to input the template plan into their computers and tailor it to incorporate additional regulatory requirements specific to individual companies worldwide and print the required documents. Together, the book and CD contain everything required to develop and execute a successful Master Validation Plan based on FDA guidelines for the pharmaceutical industry, and allows the templates to be extended to diagnostic products, medical device, medical equipment, and biotech industry products.